While my archaeological journey began in Italy and I still hang out with the Etruscans of Poggio Civitate, my day job is with the Archaeological Exploration of Sardis as the Publications Data Manager, a brand new position which I began in March of 2014, and FINALLY I’ve made it to site after messing with their data, images, documentation, and all things print and digital. Most of the time I’m in Cambridge (Somerville to be exact) cleaning up data, digitizing images, archivally storing those images, copy editing, website developing, and answering questions from scholars and fans of the Lydians and those who came after at Sardis. My first day on site began with a ride in a land rover far older than I, crammed into the back with six conservators and equipment, to watch them take photos and take care of business on some newly exposed floor levels. The thing sounds like a swarm of bees, but looks like a good time to play with. It’s less fun to have it flying right above you as you sweep a floor. I got to hold a newly-lifted vessel in a box on its way back in the Land Rover to the compound. Now I’m becoming accustomed to this depot, and after an hour it feels like home. 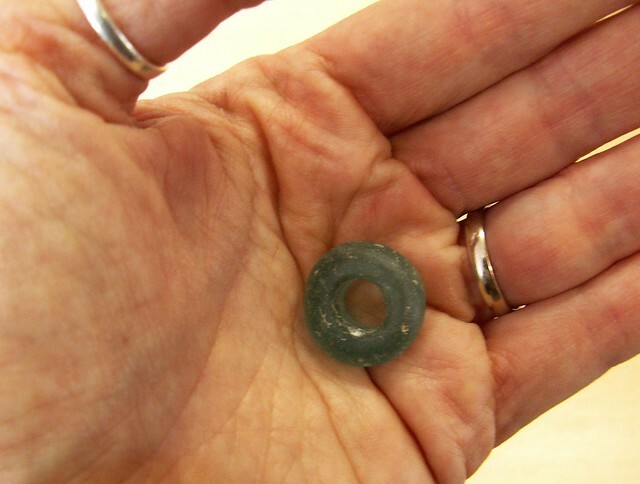 I finally have the chance to weigh and measure a set of Byzantine glass weights that a scholar asked about a couple months ago for a new publication on this object type. Feels good to finally hold in my hands the objects I’ve only longingly gazed at in the images I archived. Here at Sardis I’ve seen over 50 years of excavation, from paper tags to photogrammetry, shovels and drones, ancient past, less ancient past, recent past, present, and future. So happy to be a part of it all. Sarah is a volunteer at Hampshire Cultural Trust and has been working with Lesley (who is not in today so we couldn’t get a snap of her!) 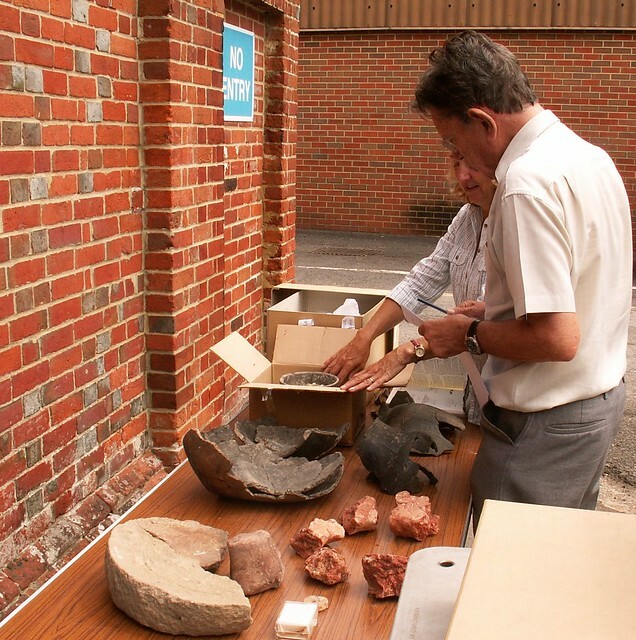 to prepare a display on some of the material from 1970s and 1980s excavations at Calleva Atrebatum (Silchester). 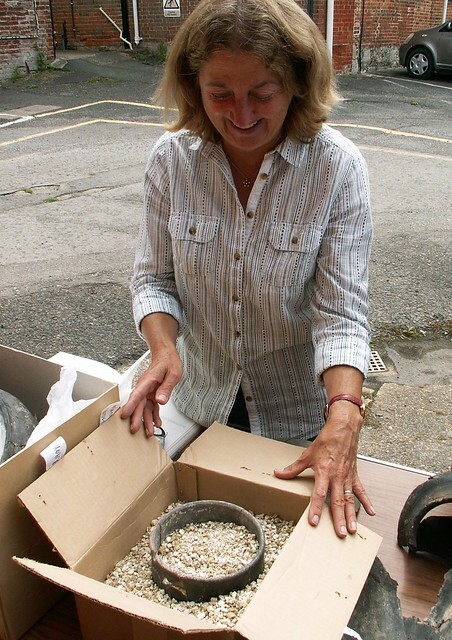 The pieces will be on display at the Willis Museum in Basingstoke, another Trust managed museum, from the 15th to the 29th August and will accompany a special exhibition ‘Silchester: Life on the Dig’ which is made up of works by Silchester’s Artist in Residence for 2014, Jenny Halstead. 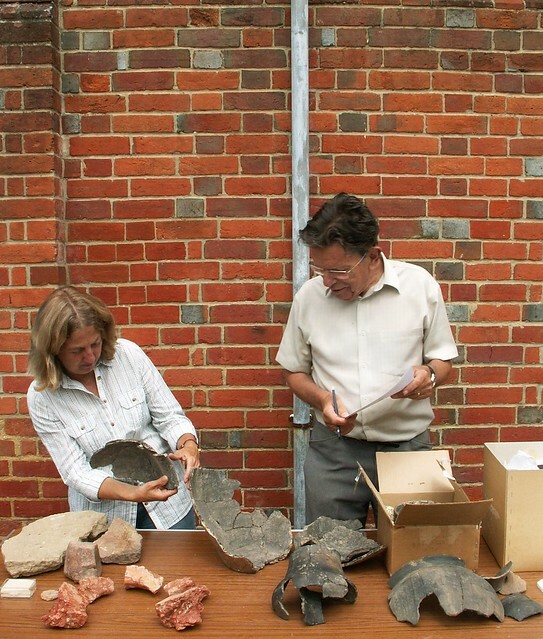 The exhibition will be on display in numerous other locations in the south, but the Silchester objects that Sarah has been selecting will be exclusive to the Willis Museum. 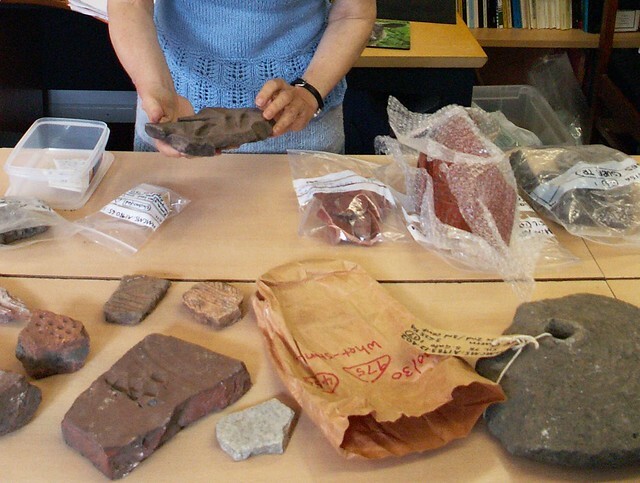 Sarah and Lesley need to choose a representative sample of objects, but also to identify objects that are appropriate for display, because they have an interesting feature, are not too fragile, and in the case of some of the tiny coins, large enough to see! 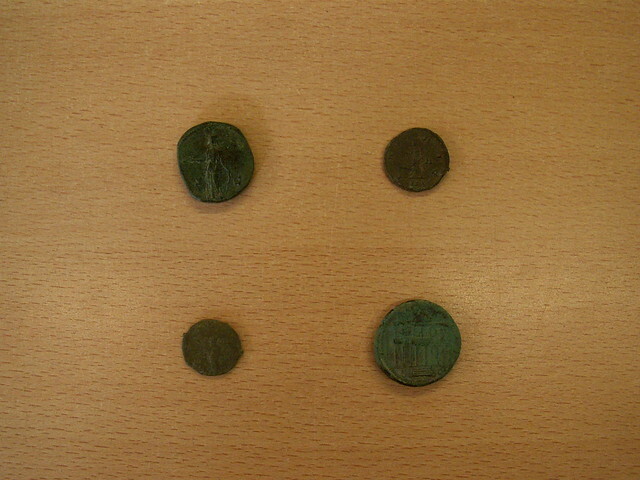 They picked out a selection of coins, there is also a glass bead that will be included in the display. 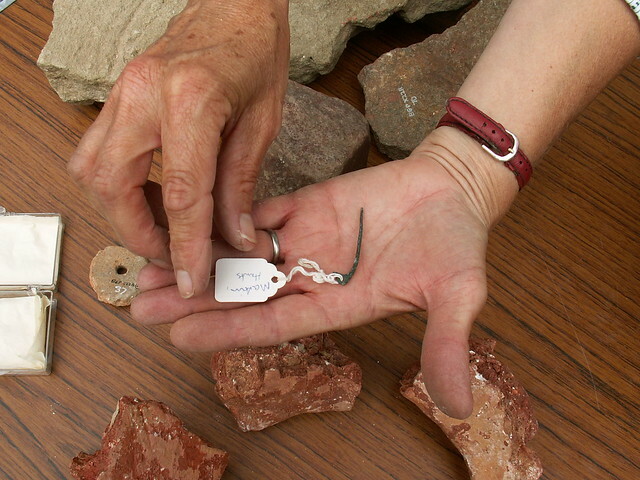 Sarah is holding a whetstone that is a fragment of sandstone, originally used as a roof tile, and then reused as a whetstone to sharpen chisels. 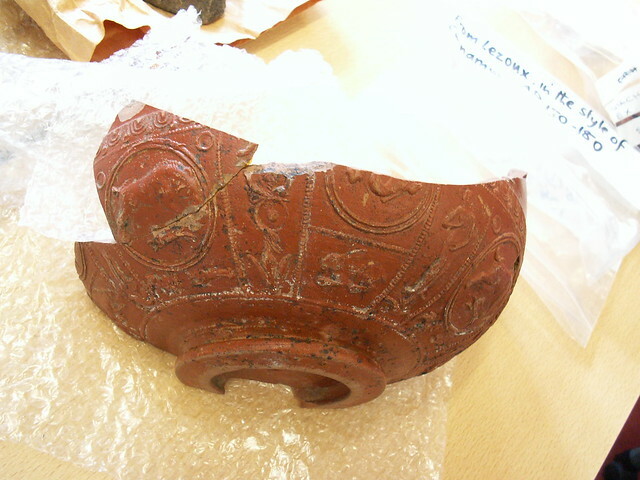 The Samian bowl is very attractive and caught the eye of both of them when they were selecting items. It has all sorts of animals, including a deer, a goat, a hare, a boar, a bird, a dolphin, around the outside of it, and Sarah and Lesley thought that it would be fun to find out a bit more about the decoration. 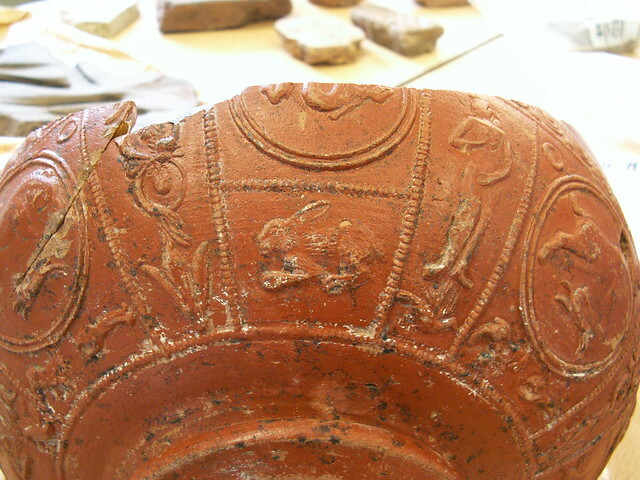 The bowl was made in Lezoux in the 2nd century AD. 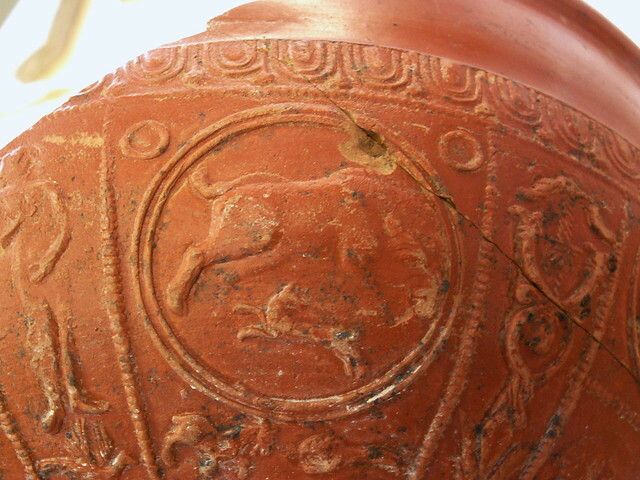 A boar and a hunting dog? 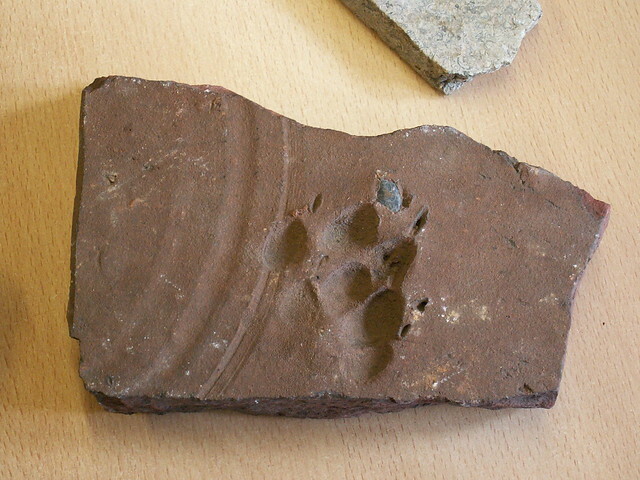 The pair also found some nice details on some of the tiles in the stores, including one that has a clear dog print on it. Finally, just before re-packaging the items to be sent over to the Willis Museum, Sarah needs to type and print labels that will go on display alongside the objects. 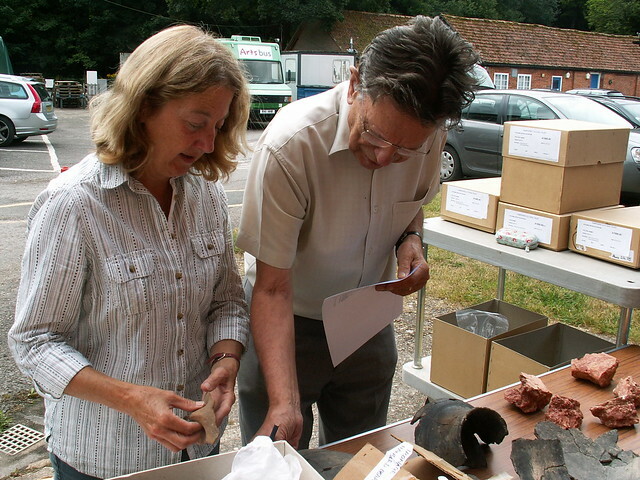 This task can be quite time consuming as it is nice to be able to provide a little contextual information for each object, and so some research must be done for some of the less common artefacts. 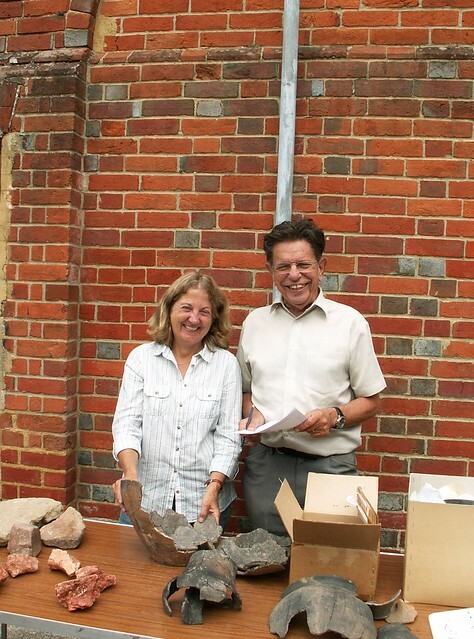 It all started as a field school opportunity in the summer of 2001, and I never thought I’d help run an Etruscan archaeological project for 14 years. 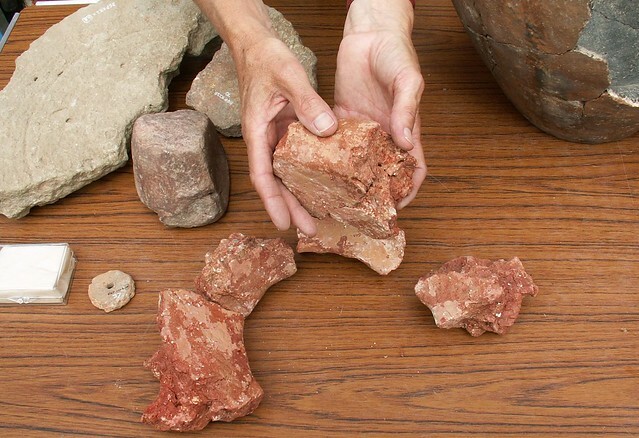 From minion, to trench master, to cataloguer, I found my niche there as manager of materials and inventory for the lab and storerooms, or Magazzino, at the Poggio Civitate Archaeological Project, located in Vescovado di Murlo, near Siena, Italy. 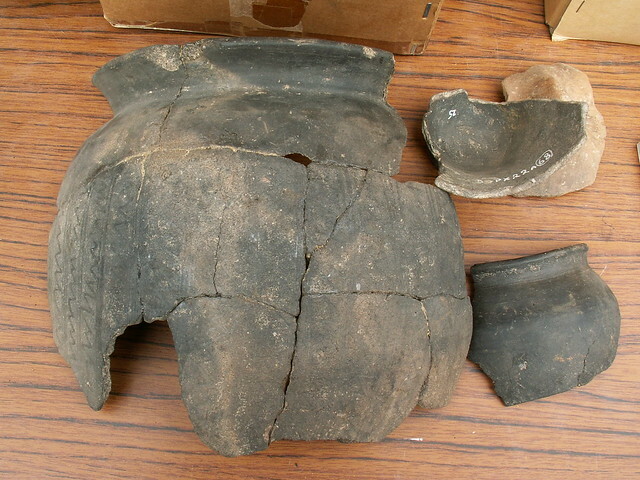 Excavations have taken place continuously since 1966 and is now through the University of Massachusetts-Amherst and directed by Dr. Anthony S. Tuck. The hill of Poggio Civitate, seen from the town of Vescovado di Murlo near Siena, Italy. The Etruscan site is hidden in the woods on top of the plateau. 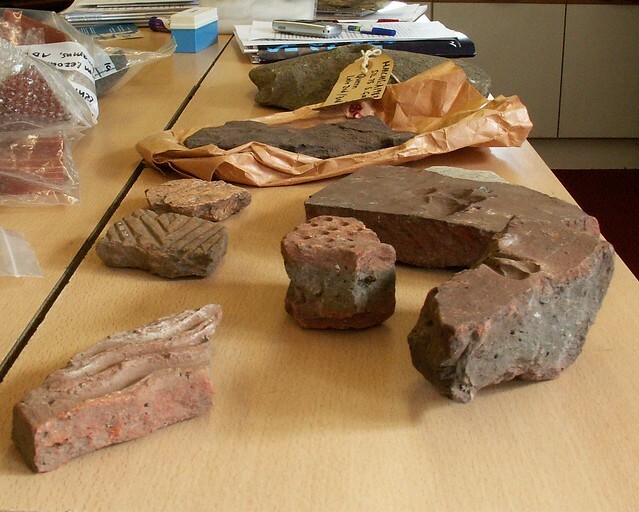 One wall of our working inventory of artifacts located in the Magazzino (storerooms) below the medieval town of Murlo. I have since left work at Poggio Civitate to continue my professional career at Sardis in Turkey, but I came back to PC this summer to check in and help out for a bit. 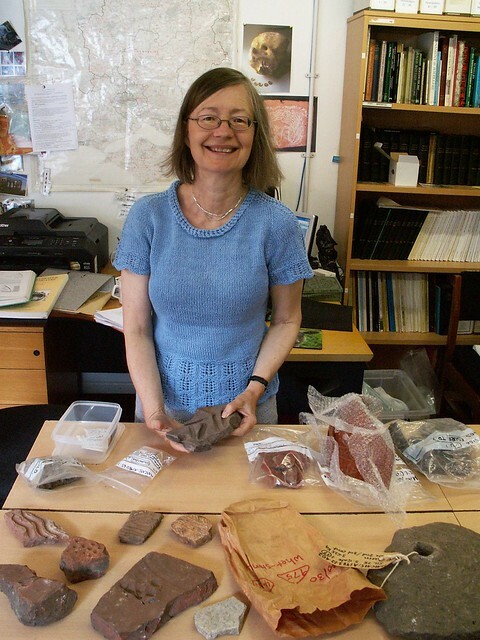 What is a day in the life of an archaeological multitasker? Well, the morning starts out with unlocking and airing out the storerooms, checking in with the conservator to see how we should best utilize our student workers, and filling water bottles. As students arrive and are sent to dry brush ceramics found the day before, I check in with the director to establish priorities for the day, and that may involve cataloguing artifacts that have been cleaned and conserved, looking for comparanda for newly excavated objects, cataloguing objects excavated decades ago but never catalogued, pulling materials for scholarly publication, passing objects along to be photographed or illustrated, making inventory lists, tracking down missing information from the find tags made by trench leaders, restarting the database server if it goes down, flipping through old field diaries to find missing information from the database or to provide our GIS specialist with as much data as possible for mapping old trenches, etc. Let’s say I know where information is, whether physical or electronic, and spend the day either providing it or gathering it. Of course there are the annoying bits, too…tourists wandering down into the storerooms by mistake, the town handyman needing to move a vehicle, but in order to do so, we need to move tables of pottery fragments, letting the cook know how many people are having lunch, eating lunch in a driveway, moving heavy things, killing bugs, and running supplies up to site when they run out. But as head of the archive, I get to teach students and learn new things from them, work through issues with dedicated, enthusiastic colleagues, poke through boxes and boxes of nearly 50 years of excavation history for objects 2700 years old, and be a part of something that’s much bigger than myself. At the end of each day I check in with the trench masters to see their new finds, spread out their pottery to dry, and make sure the conservators get their hands on new sets of projects and problems. Sweep the floors, close and lock up the archive, then march back to down for dinner and sleep before starting all over again. 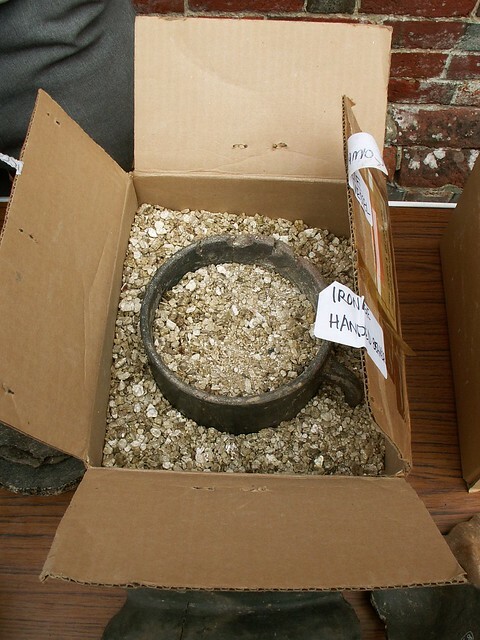 These few boxes in the foreground are the site archive (the finds as well as excavation records and other important documentation) from two sites to the west of Fishbourne Roman Palace. 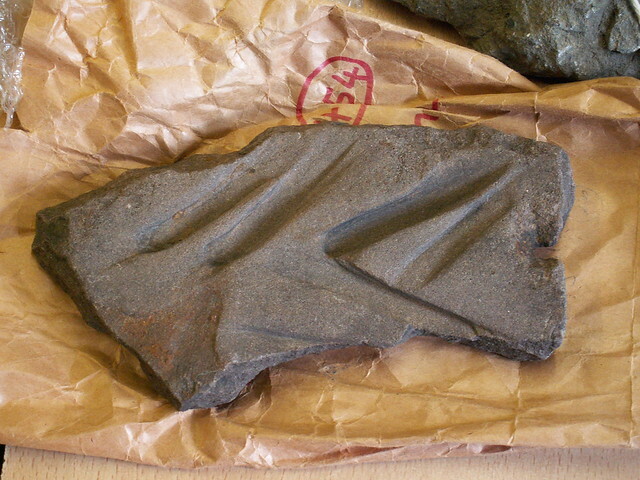 We have stored them for around 15 years but always known that they don’t come from our collecting area. 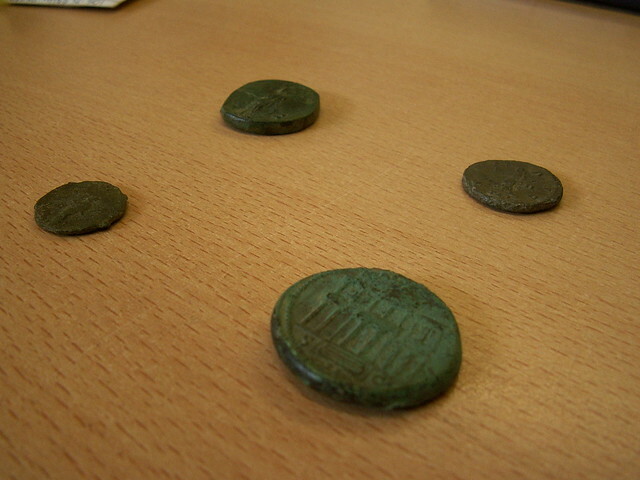 Instead the come from the collecting area of Chichester Museum (“The Novium”). 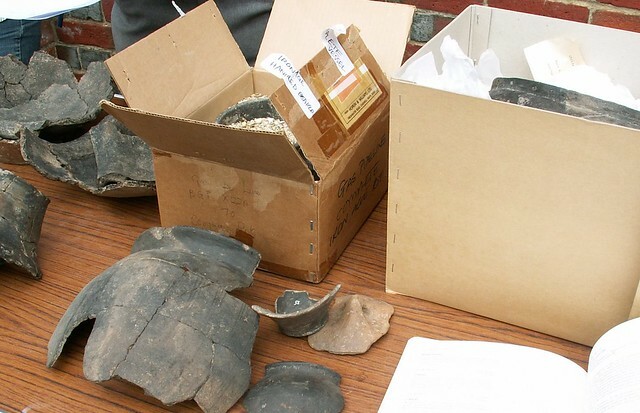 It seems that these archives were given to Fishbourne Roman Palace in error and should actually have been deposited with The Novium . 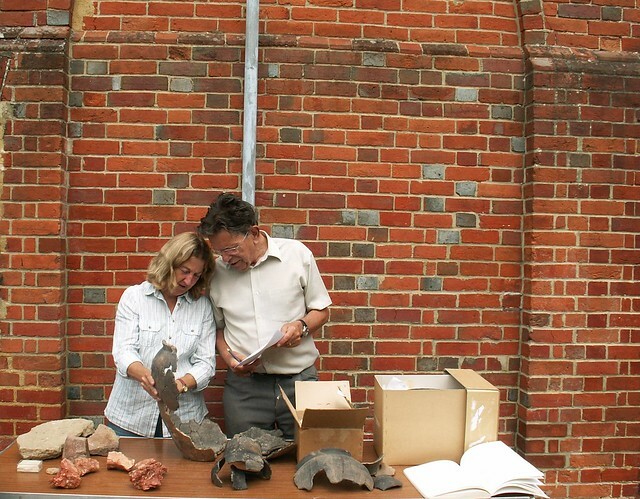 The collecting area is, unsurprisingly, the area from which a museum collects archaeology. Every museum should have its own area. These should not overlap and there should be no gaps. In reality, it’s rarely as simple as that! Anyway, we have been working with The Novium to try to transfer these archives from our collection to theirs, and today we finally completed the paperwork needed involved. It has taken several months in total. Transferring an archive is not a straightforward process and involves a lot of form-filling. 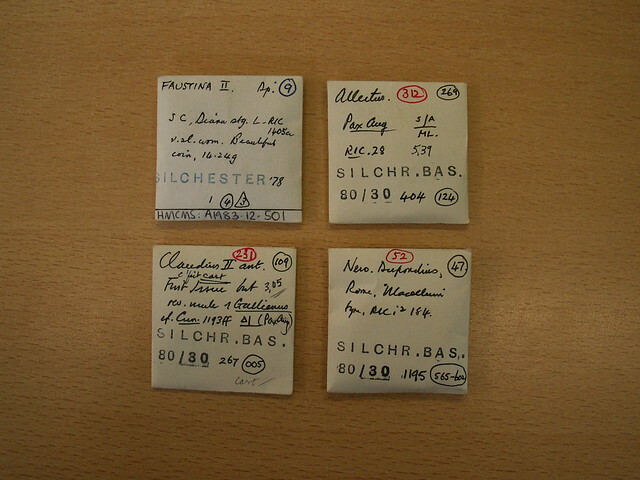 It is important to create a clear record that the material was once owned by the Palace and has since been passed on to The Novium. This will avoid confusion in the future and so is worth it, even if in reality the archive has only moved a few yards from one end of our shared store to the other!! This time last year I was finishing writing up my postgraduate degree thesis whilst panicking amongst books, AutoCAD and copious amounts of tea. 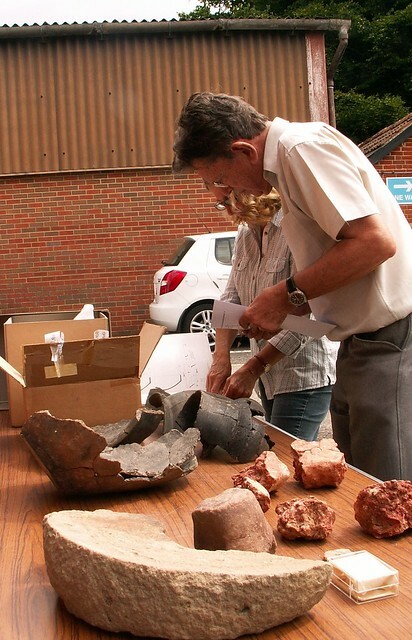 As I procrastinated on twitter (after doing lots of work, of course) I avidly followed last years Day of Archaeology, wondering to myself if I’d be in a position to post anything for the next event. 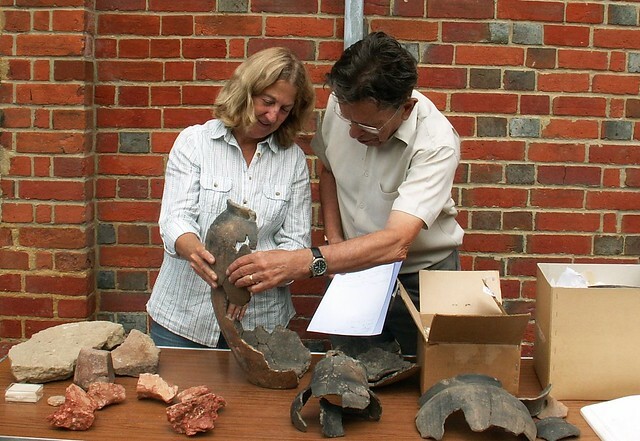 This job is perfect for me as it combines my love of research, archaeology and working with the public. Although I’m very new (I only started this month) I am thoroughly enjoying it and am learning something new every day, and this for me is the most important part of any career or volunteer project. My daily life does not directly involve working in a “traditional” archaeological setting; I do not excavate or deal with physical remains on a daily basis. 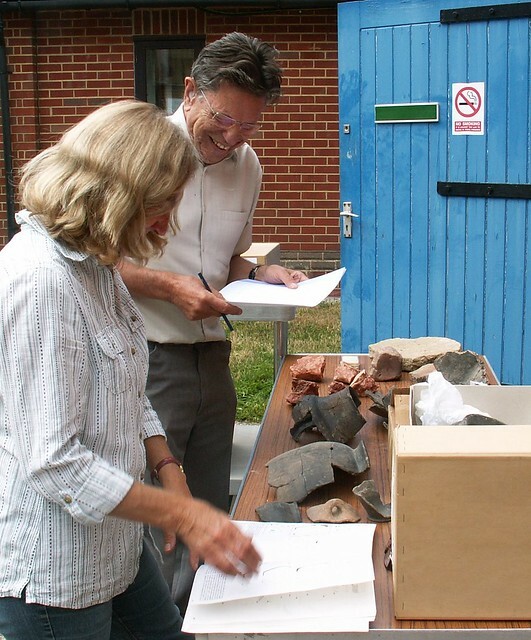 Nevertheless, I assist both heritage professionals and members of the public alike to carry out a variety of projects by helping them to undertake documentary research, and this is a very important part of archaeology. My day started with the usual morning check of emails and answering requests from previous enquiries I have already carried out and undertaken. A big part of my day involves carrying out research of our archival holdings on behalf of the public, whether on their house or searching for plans of a particular English Heritage property. This means that I often have to search and handle a variety of archives ranging from measured drawings and 18th and 19th century building sales catalogues to photographs. These photographs can range in date from present day to the 19th century. Today was no different to this; I have been completing research about small listed houses in Gloucestershire and searching plans and elevations of Osbourne House, Isle of Wight and Kenilworth Castle, Warwickshire. Each day is different in that I never know what I am going be doing one day to the next, and this is what makes me so passionate about what I do. In the afternoon, I contacted customers and sent out the information I had found, and answered queries about our archives. I’m still learning my job but am enjoying every minute- especially learning about different areas of England I didn’t know anything about. At the end of the day I organised visits to the archive for customers and started new enquiries, ordering some archives from our cold store. Much of our holdings is fragile and is stored in climate controlled conditions and has to be acclimatised to room temperature before it can be viewed. As this takes 24 hours, ordering in advance is essential.